In any customer-facing role, employee name badges are essential. 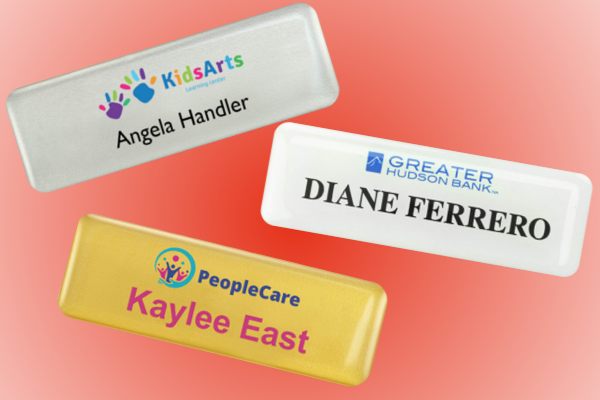 From retail stores to banks, rental car facilities to fast-food restaurants, a good name badge helps increase professionalism and encourage friendly interaction between your employees and your customers. After all, a customer is far more likely to remember an employee if he or she knows the employee's name, right? When it comes to employee name badges, the "right" solution really depends on an organization's needs. Regardless, there are a variety of options to choose from. PVC ID cards look professional, but often need to be bought in bulk or require the purchase of dedicated equipment to print the cards yourself. Paper ID cards are affordable and simple, but aren't the most "easy-on-the-eyes" solution and often give off an amateur vibe. The perfect solution is something that's high-quality, yet easy to acquire; professional, without requiring the investment in pricey equipment. Fortunately, there's a product to meet those needs, and it's one that can be designed from the comfort of your home or office. Add a logo, add employees and go!